As I have said before, we are getting into raising Pastured Poultry. Our newest chicks arrived the other week. They are Jumbo Cornish X. They are nothing like our Rhode Island Reds! The heat has not helped us either. Eventhough baby chicks need to be kept warm, it's been so hot, we have had a tough time telling if they are too hot! We also had some issues with an intestinal parasite. 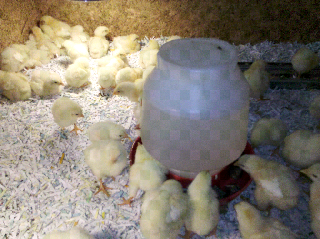 With some new feed and water additives, the chicks are finally looking good. We have lost 7 and another one this morning but I am hoping that that will be the last chick we lose! 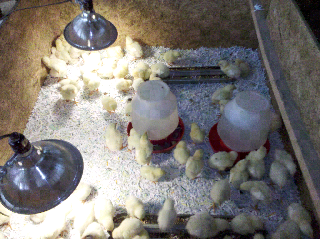 These are our first try at growing broilers. They are growing MUCH faster than the hens did. They will be moving out to pasture in another week or two. We have to get the pen built first!